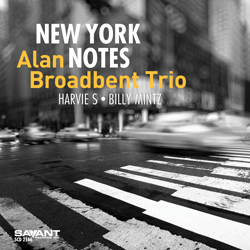 Justly famous for his gorgeous compositions and arrangements for a long list of singers including Natalie Cole, Diana Krall and Paul McCartney, Alan Broadbent is also a pianist's pianist: possessed of fierce technique; exquisitely emotional, when the moment calls for it; and as hard-swinging as they come. Throughout these performances — recorded for all intents and purposes "live" in his private recording studio, unrestricted by the confines of time — there is a remarkable polish and sense of order while maintaining the unmistakable sound of the classic piano trios, live and off-the-cuff. With his long-time associates Harvie S and Billy Mintz on hand it is little surprise that their almost telepathic communication gives the entire session an extremely wide emotional range encompassing, graceful delicacy, earthiness, soulfulness and just a little hint of the blues.